Leopard Shark (Triakis semifasciata) | Better Know a Fish! Last month, I visited Gainesville, Florida, attending the annual meeting of the National Association of Science Writers, as well as taking in a fishseeking side trip. My flight itinerary back from the conference was daunting — three flights spanning 13 hours — and with a sigh, I packed myself into the snug sardine can that was my second flight. Exhausted, I slumped into my aisle seat once my two rowmates settled in, and promptly fell asleep. I woke up in time for the beverage service. When my seat neighbor reached out to take his drink from the flight steward, my groggy eyes perked open: the gentleman next to me had a large shark tattoo on his forearm. It wasn’t just any shark. This tattoo was not a gross caricature or cartoon. It wasn’t the stereotypical ferocious-looking white shark or hammerhead. There was no deadly, toothy grin, and the spotted markings were not randomly placed. Here was a tattoo particularly drawn and detailed after a very specific shark species. Clearly, I was sitting next to another fish enthusiast. And clearly, I had to learn the story behind the tattoo. “I’ve had many people ask me about the tattoo, but only two knew what it was,” said my neighbor, who introduced himself as Chris. 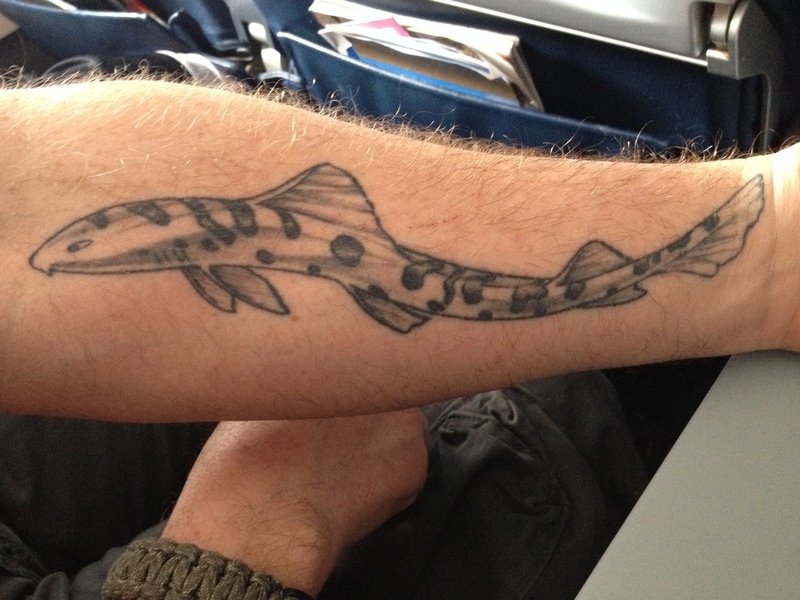 On his arm was a tattoo of a leopard shark (Triakis semifasciata), a member of the hound shark family, Triakidae. Leopard sharks are unique to the Pacific coast of North America, from Oregon south to the Gulf of California. Chris explained that he has been scuba diving since he was 14. He likes to draw species he had seen in the wild, then turn them into tattoo designs (on his other arm was a turtle). Like many of us, Chris said that growing up, he wanted to be a marine biologist. But a knack for all things mechanical steered him down a career path in heavy machinery. “I tinker,” he said, humbly. Starting on bicycles as a child, Chris worked his way up to trucks, pumps, CNC (computer numerical control) builds, cars and then tractor-trailers. He told me of his responsibilities as a welder, mentoring young guns not yet wise to the risks of dangerous chemicals and hazards, and of his assignments inspecting manufacturing plants, requiring him to be able to visualize and piece together entire facilities in his head. Despite his profession as a mechanic, Chris said he tries to get back in touch with the ocean whenever he can. His parents and his upbringing seemed to have instilled a life-long appreciation for nature. Chris talked about his various stops around the country, stints in San Diego and Seattle, St. Croix and Florida. But Oregon seemed to have been a place of many fond memories, and it was in Newport, Oregon, where Chris took his advanced open water diving coursework. If he wasn’t riding dirt bikes on the dunes, he was underwater in Yaquina Bay. And what better creature to leave an imprint on one’s heart — and arm — with such sleek form, elegant spots, and even disposition? As most sharks do, leopard sharks swim about the seas like journeymen traveling the land, quietly going about their business, corralling small fish or digging up clams, worms and rays to eat. The leopard shark is adaptable to all circumstances — equally at home in kelp forests or seagrass beds, salt marsh lagoons or aquarium exhibits. It is a fine design of mobile, natural machinery, and an antithesis of toothy, cartoon savagery. My impression of Chris was that of a quiet, down-to-earth person, appreciative of his life and gifts. Talking about fish, though, clearly puts him in a lightened mood. Our conversations later in the flight would turn to some of his household menagerie — including the unfortunate, urine-prone habits of a tiny, territorial sugar glider that belong to his kids. But inevitably, we would come back to the subject of fishes. As for the fish tattoos, Chris said he hopes to add quite a few more to his arm. This entry was posted in Carcharhiniformes, Chondrichthyes, Estuarine Fish, Marine Fish and tagged aquarium fish, Carcharhiniformes, hound sharks, leopard shark, Pacific Ocean, shark, sharks, tattoos, Triakidae, Triakis, Triakis semifasciata. Bookmark the permalink. Just last week I saw a litter of juvenile “baby” leopard sharks playing in the surf at Laguna Beach, CA.